Call it what you will—we hear “integrated sink countertop,” “counter sink,” “integral sink,” “single-piece vanity sink,” and all sorts of other variations—but a vanity top with a built-in sink has long been a popular choice in bathrooms and is emerging as a favorite look for modern kitchens, too. Today’s integrated sinks offer incredible variety, as they’re available in a breadth of materials from quartz to copper, marble to concrete, and in enticing finishes like brushed nickel, antique copper, slate, and ash. An integrated bathroom sink is a foolproof way to simplify the bathroom remodeling process, as it takes out some of the guesswork—and work—involved with perfectly coordinating a sink to a countertop and vanity. Want to know what else we love about integral sinks? Read on. This is a big one. A single-piece design doesn’t have any cracks or crevices between the sink and counter, where gunk notoriously collects. This makes this sink incredibly easy to clean—ideal for powder rooms that need a quick wipe-down before guests arrive. 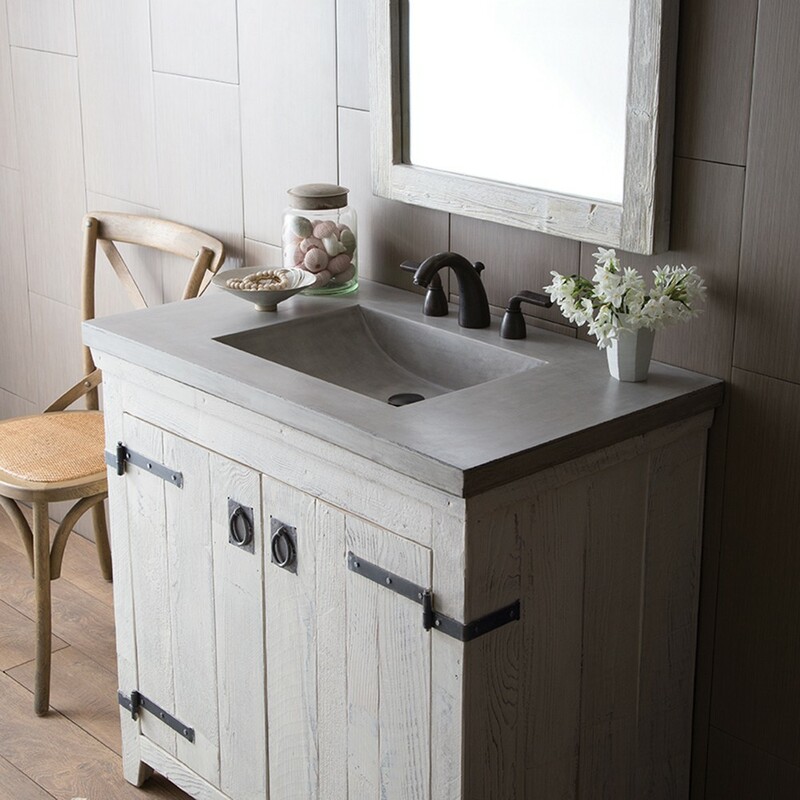 Our NativeStone® Concrete vanity tops (shown above) will even resist staining! If “integrated sink” brings to mind those ugly, old-school plastic jobs — think the pastel pink seashell sink of yore — then you haven’t yet seen the new models. (By the way, our take on the seashell sink, the Calabash, may have you rethinking the shell sink.) Integrated sinks today feel extraordinarily high-end because they’re often made of luxurious materials such as hammered copper or marble. And the fact that they’re hewn from, or carved from, the same slab heightens their appeal. We suggest hiring a professional plumber to install your sinks and countertops correctly and safely. However, if you do have a mind to D.I.Y., then integral sinks are for you. Integrated sinks also make it easy for a homeowner to update an old vanity. Want to know more about various bathroom sink styles? Learn the benefits of a trough sink, and review the pros and cons of vessel sinks.